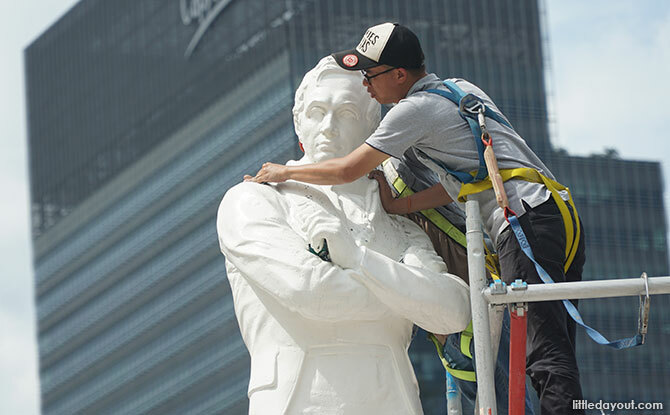 A couple of days ago, we reported on the “disappearing” Sir Stamford Thomas Raffles statue along the Singapore River. Now, there is a new development to the story with The Arrivals – a set of four new statues that now stand next to Raffles. When we visited the Raffles Statue earlier today, we are happy to see the iconic statue returning to its former pristine self. 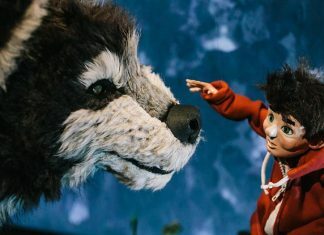 However, something was different at the monument site. The Stamford Raffles statue was no longer alone but had several new companions. 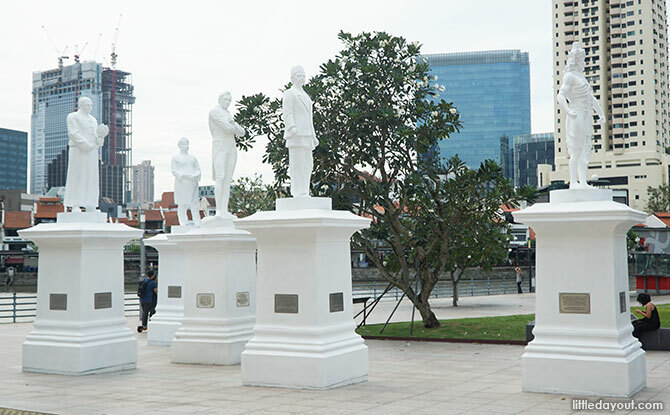 Four new statues have been erected next to Raffles in conjunction with the Singapore Bicentennial 2019. Flanking Raffles are statues of four personalities from Singapore’s past – Sang Nila Utama, Munshi Abdullah, Naraina Pillai and Tan Tock Seng. 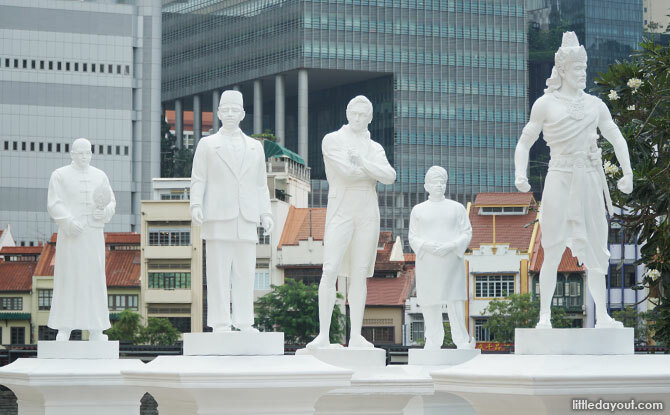 The statues are part of a work The Arrivals unveiled for the Singapore Bicentennial 2019. 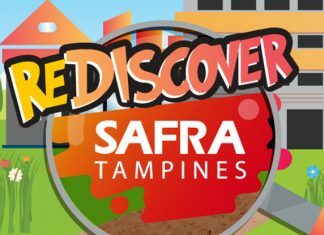 Munshi Abdullah, Naraina Pillai and Tan Tock Seng arrived in Singapore in 1819, the same year as Raffles while, according to the Singapore Bicentennial Facebook page, Sang Nila Utama arrived in 1299. The Arrivals – Who were Sang Nila Utama, Munshi Abdullah, Naraina Pillai and Tan Tock Seng? 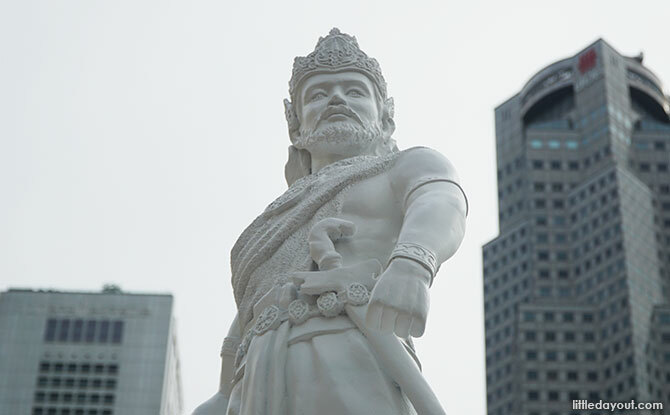 Sang Nila Utama was a Palembang Prince who is said to have seen a lion upon landing in Singapore, naming the island Singapura or Lion City. Naraina Pillai was a community leader who established the Sri Mariamman Temple, Tan Tock Seng was a businessman who gave back to the community and Munshi Abdullah was Raffles’ interpreter who later went on to earn the title of “The Father of Modern Malay Literature”. 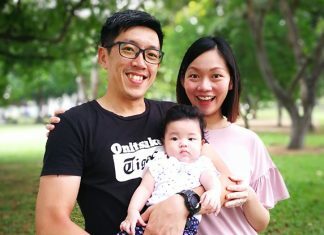 These personalities, and The Arrivals, represent the various peoples who arrived in Singapore and help to contribute to Singapore’s development and history. 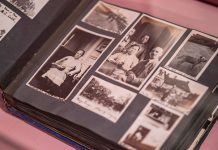 The Arrivals will be on display till 31 December 2019. 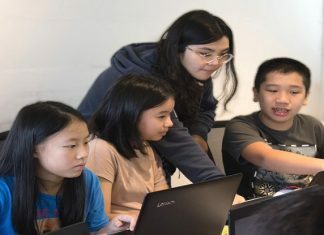 To find out more about the Singapore Bicentennial 2019, visit its website here.